The recall commenced on 27 August 2014. Currently 52 suppliers have recalled the cable. Our frequently asked questions provide detailed information about the recalled cables. What cables have been recalled? All sizes and configurations of TPS and Orange Round mains power cables sourced from Infinity Cable Co Pty Ltd and supplied under 'INFINITY' and 'OLSENT' brands are affected. The cable is labelled 'INFINITY' or 'OLSENT' at 1 metre intervals. 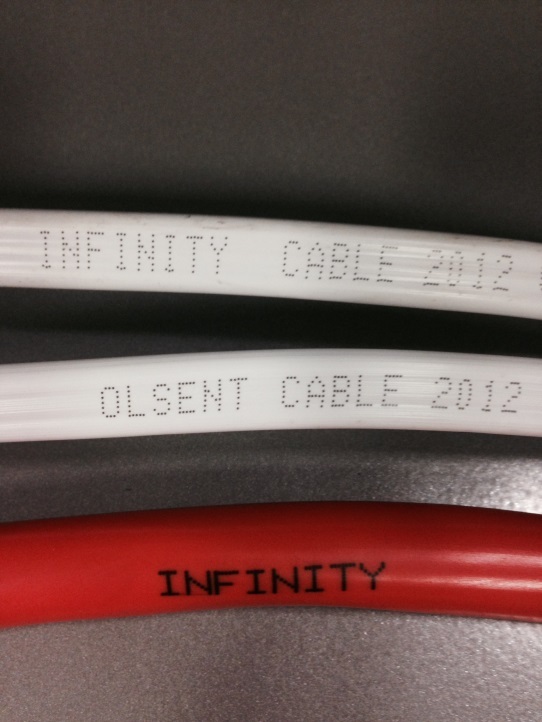 Not all 'OLSENT' branded cable was sourced from Infinity Cable Co Pty Ltd. Masters Home Improvement can arrange for a visual inspection of 'OLSENT' cable to determine whether the cable is affected by this recall. You can find further details on the Recalls website. Why have the cables been recalled? The cables do not comply with the ageing requirements of the electrical safety standard, AS/NZS 5000, and expert advice is that they may become prematurely brittle and break if disturbed, exposing the internal conductors and potentially causing electrocution or fires. Is all cable from Infinity Cable Co Pty Ltd a problem? The recalls apply to all sizes and configurations of TPS and Orange Round mains power cables sourced from Infinity Cable Co Pty Ltd and supplied under 'INFINITY' and 'OLSENT' brands. You can find further details about the recall and photographs of the cable on the Recalls website. Tests have shown that the cable insulation may become prematurely brittle, which could cause fires or electrocution if the cables were then disturbed, such as by human or animal activity. Because the risk is imminent, people need to be aware and take careful steps to manage the risk in coming years. Has any of the cable failed yet? No, there have been no reports of failure yet. When exactly will the cable become brittle and the risk develop? All cables age at different rates subject to ambient temperature and the load placed on them. Current expert advice is this cable may become brittle from 2016 onwards, and suppliers have been asked to assess and work on the oldest and/or highest risk installations first. Who supplied the Infinity Cable? Infinity Cable Co Pty Ltd (in liquidation) imported, the cables and they were supplied to a range of wholesalers, retailers and installers. How did it get to be supplied in the first place? Electrical safety regulation is managed under state and territory legislation and the intensity of pre-market verification is risk based. The first samples of cable being offered by the importer, Infinity Cable Co Pty Ltd, were supported by accredited testing certification. Subsequent testing by regulators identified the safety issue. Shouldn’t government agencies check each batch? Routine testing of final products and waiting for results is inefficient. The electrical and building regulations, the common law and the various provisions of the ACL provide a framework under which suppliers need to ensure their products are safe for consumers before they enter the marketplace. Does all the cable need to be removed and replaced under the recall? any premises with cable left installed to have an appropriate warning sticker affixed to electrical metering/switch box. If the cable gets brittle isn’t it dangerous to leave cable in conduit or in wall spaces? All cable insulation gets more brittle with age. Without physical disturbance this cable is no different than other older cable that is still in service. Do consumer guarantees also apply under this recall? This recall under the Australian Consumer Law relates to the safety aspects of the defective goods. The wider consumer guarantees provide a mechanism for consumers to address safety and quality issues. For more information about consumer guarantees and faulty products, see: Consumer guarantees. Why isn’t the recall being undertaken by the importer? The cable was imported into Australia by Infinity Cable Co Pty Ltd. That company is now in liquidation, so payments of money and disposal of other assets must be managed according to the provisions of the Corporations Act. When a company is in liquidation those provisions guide the liquidator not to incur any expense in relation to the winding up of a company unless funds are available. This means when there are little or no funds, the company in liquidation is not necessarily expected to take steps in response to any recall notice. Why isn’t action being taken against the manufacturer in China? Pursuing legal action in other countries is dependent on a series of complex international laws and treaties. The Australian Consumer Law recognises this complexity by regarding the importer as the manufacturer and responsible entity. How do I check if the recalled cables are installed in my house? Don’t attempt to inspect cables yourself. If you have had electrical wiring work carried out on your home or business in 2010-2013 (in NSW), 2011-2013 (in ACT), 2012-2013 (in Vic, Qld, SA & WA) and in 2013 (in Tas) you need to contact your electrician to check if recalled Infinity electrical cables were used. If you are unsure who did the original electrical work, talk to your builder. If you don’t know who the builder was, and are unsure if Infinity cables were installed, ask a licensed electrician to inspect your wiring. Do I have to pay an electrician to inspect my house and business? If you want your wiring inspected, the cable supplier should be given the first opportunity to organise this. If you are uncertain who the cable supplier was, you can arrange for a licensed electrical contractor to inspect your wiring. Inspection costs are not recoverable from cable suppliers if Infinity or Infinity-sourced Olsent cable was not installed or if the cable supplier cannot be identified. We recommend you mention that you want a safety inspection for Infinity cable, as industry associations have been asking their members to prioritise safety inspections for consumers. If a safety inspection reveals Infinity cable, the costs of inspection are expected to be met by the supplier as part of the recall. If you don’t have any of the cable you will have to meet the costs of inspection yourself. Suppliers and builders may have preferred electricians, so if you know your builder or supplier, contacting them could lead to reducing the costs of inspection. What if the recalled cables are installed in my house from work done by an electrician? Who pays to get it fixed? You should speak with your builder or electrician to discuss how the cable installations can be rendered safe. If an electrician supplied and installed Infinity cables in your home, then you are entitled to ask the person to arrange for you to receive a remedy from one of the cable suppliers undertaking a recall. If your electrician does not know who the cable supplier was, you are still entitled to ask the person to fix the problem under the consumer guarantees of the Australian Consumer Law. While it depends on the circumstances, consumers may be entitled to a remedy including a repair, replacement or refund. If there are problems, you may also wish to contact your local electrical regulator about safety issues, or contact your local state or territory consumer protection agency about your rights under the Australian Consumer Law. Why isn’t the original electrician doing the work? During recall negotiations with suppliers they asked to be able to use their preferred electrical contractors. The electrician tells me he will do the work required under the safety recall but not replace all of the cable, only the accessible cable. Can the electrician be made to do all the work at the same time? The recall requires remediation of cables in high risk locations. Consumer guarantees provide a mechanism for consumers to address quality issues. Consumer guarantees provide a mechanism for consumers to address quality issues. For further information about how to proceed on quality issues that might be covered by consumer guarantees, contact your local Australian Consumer Law regulator. What if I don’t have an invoice or I can’t locate or remember the original electrician? Who pays to have my house inspected and fixed? If a safety inspection reveals Infinity cable, and you can also identify the supplier, some of the costs of inspection may be met under the recall. If you can’t locate the original electrician, speak to your local state or territory consumer protection agency. If you don’t have any of the cable, you will have to meet the costs of inspection. I have just purchased the property so who pays to have my house inspected and fixed? If a safety inspection reveals the presence of Infinity cable and you can determine the supplier it came from, some of the costs of inspection may be met under the recall. My electrician tells me the cable supplier they used does not appear on the ACCC website or on the website of the local fair trading regulator. Who can assist me to understand my rights? Please make contact with your local Australian Consumer Law regulator. How much does it cost to get the cables replaced? This recall is intended to replace all Infinity cable that is accessible (e.g. in a roof space and not in a protective conduit) or installed near a heat source such as a heater, halogen lighting or hot water system. Other cable will remain installed under the safety recall. The cost of replacing cables depends on a case-by-case basis. If you are not covered under this recall, the ACCC recommends getting quotes from licensed electrical contractors. You can find licensed electrical contractors on the internet, in the phone book or through industry associations. Your electrical safety regulator may also keep an internet register of electricians licenced in your state or territory. I am renting, what do I need to do? If building work involving electrical wiring has been done in a relevant period when Infinity cable was supplied in your state or territory, speak to your landlord or managing agent. You can also do this if you’re unsure whether any electrical work was done. I live in an apartment block with a high turnover of tenants. How are we supposed to know what electrical wiring work has been done? You should speak to your landlord or managing agent. My electrician is busy with other jobs. Does the person have to replace the cables within a certain time? As the degradation of cable insulation is related to elapsed time and heat exposure, suppliers have been asked to assess and work on the oldest and/or highest risk installations first as far as possible. Someone knocked on my door offering to inspect my house for free. What should I do? Be cautious of ‘free’ offers to inspect cables and make sure the person inspecting cables is a licensed electrician who is trained to identify Infinity cables. You can find licensed electricians on the internet, in the phone book or through industry associations. Your electrical safety regulator may also keep an internet register of electricians licenced in your state or territory. You have rights under the Australian Consumer Law when dealing with sales representatives such as door-to-door sales people, including the right to say ‘no’ and a ten- day cooling off period. For more information, see: Telemarketing and door-to-door sales. Is there government funding or other assistance with these recalls? All voluntary or mandatory recalls under the Australian Consumer Law are undertaken by suppliers at their own cost. As an electrician, who will recoup my costs as the Infinity cable importer is in liquidation? The costs of the recall are being covered by the cable suppliers and they are making all of the arrangements for work to be done by electrical contractors of their own choosing. Electricians should therefore contact the cable supplier before doing any work that they hope to be reimbursed for. The taskforce expects that electricians and builders will co-operate with suppliers to achieve the best outcomes possible. I am an electrician, builder or supplier and I’ve incurred costs or lost money due to remediation work. Can I claim these as business expenses for tax purposes? Expenses or losses you incur in carrying on your business are generally tax deductible. We suggest you consult your tax adviser about whether, in your circumstances, any expenses or losses you incur in relation to remediation work is deductible. As an electrician, my records indicate I haven’t done work on a property, but the owner insists I have and is demanding an inspection? You can ask to clarify the basis on which the owner makes the claim, and see if they have a receipt or other records. If you’re completely sure you didn’t do any work on that property, you’re not obliged to conduct a free inspection. I am an electrician and although I don’t have records that show I did work on a particular property I can remember the work and I did use Infinity cable. What do I need to give the supplier to have this covered under the recall? Suppliers have the right to check that they did in fact make that particular supply. Electricians (and builders) should carefully check their records for proof of transactions such as credit card or debit card statements, handwritten receipts, lay-by agreements, or a confirmation or receipt number provided for a telephone or internet transaction. I am busy with other jobs. Do I have to replace the cables within a certain time? Priority should be given to work on the oldest and/or highest risk installations of Infinity cable. Does all the Infinity cable need to be removed and replaced under the recall? What is considered an accessible area for replacing Infinity cable? Accessible areas are those which building owners, tradespeople or the public can access and explicitly include accessible roof spaces and accessible spaces under floors. You do not have to replace the cable if it is in laid in appropriate conduit or other suitable mechanical protection that is electrically non-conductive, flame retardant (or self-extinguishing) and has an appropriate ingress protection (IP) rating that prevents access to the cable inside. What areas are considered heat sources where I must replace the Infinity cable? What happens to Infinity cable in appropriate cable conduit or that I can't get access to? If the cable is in appropriate cable conduit or inaccessible by wall, floor, ceiling space or embedded into a masonry wall surface, you must install an appropriate electrical safety switch (residual current device) tested on that cable, if that has not already been done. If installed Infinity cable is to remain on the property, what do I need to do? On completion of the work, you must affix an appropriate warning sticker to the electrical metering/switch box. This warning sticker must alert building owners and tradespeople to the presence of inaccessible Infinity cable.